"HEARTH" redirects here. For the United States Act of 2009, see Homeless Emergency Assistance and Rapid Transition to Housing. 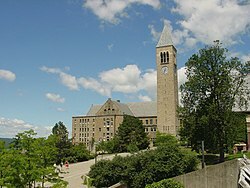 The Cornell University Library is the library system of Cornell University. As of 2014, it holds over 8 million printed volumes and over a million ebooks. More than 90 percent of its current 120,000 periodical titles are available online. 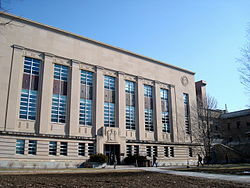 It has 8.5 million microfilms and microfiches, more than 71,000 cubic feet (2,000 m3) of manuscripts, and close to 500,000 other materials, including motion pictures, DVDs, sound recordings, and computer files in its collections, in addition to extensive digital resources and the University Archives. It is the sixteenth largest library in North America, ranked by number of volumes held. The library is administered as an academic division; the University Librarian reports to the university provost. 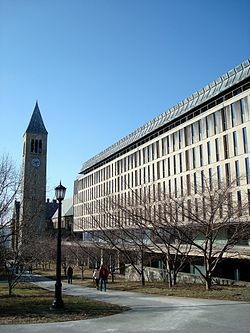 The holdings are managed by the Library's subdivisions, which include 16 physical and virtual libraries on the main campus in Ithaca, New York; a storage annex in Ithaca for overflow items; the library of the Weill Cornell Medical College and the archives of the medical college and of New York–Presbyterian Hospital in New York City; a branch of the medical library serving Weill Cornell in Qatar campus in Doha; and the library of the New York State Agricultural Experiment Station in Geneva, New York. The John M. Olin Library is the primary research library for the social sciences and humanities, and the Harold D. Uris Library has extensive holdings in the humanities and social sciences. The Albert R. Mann Library specializes in agriculture, the life sciences, and human ecology. The Carl M. Kroch Library includes the university's Rare & Manuscript Collections as well as its extensive Asia Collections. The Southeast Asia Collection at the Kroch Library, named in honor of John M. Echols, has been a joint undertaking of the university, the library, and the Southeast Asia Program with the goal of acquiring a copy of every publication of research value produced in the countries of Southeast Asia and publications about the region published in other parts of the world. Initially, the system was a collection of 18,000 volumes stored in Morrill Hall. Daniel Willard Fiske, Cornell's first librarian, donated his entire estate to the university upon his death, as did President Andrew Dickson White. 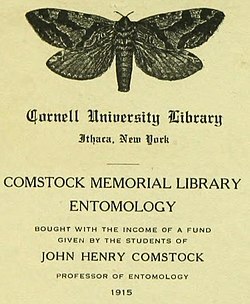 Under Fiske's direction, Cornell's library introduced a number of innovations, including allowing undergraduate students to browse through the books and check them out. By 1885, the library had installed electric lights and stayed open 12 hours per day (instead of only a few hours per week—as most other libraries at American universities did at the time—just enough time for faculty to check out and return books), which allowed students to use it as a reference library. The library plays an active role in furthering online archiving of scientific and historical documents. It provides stewardship and partial funding for arXiv.org e-print archive, created at Los Alamos National Laboratory by Paul Ginsparg. arXiv has changed the way many physicists and mathematicians communicate, making the eprint a viable and popular form for announcing new research. The "Project Euclid" initiative (named after Euclid of Alexandria) creates one resource joining commercial journals with low-cost independent journals in mathematics and statistics. The project is aimed at enabling affordable scholarly communication through the Internet. Besides archival purposes, primary goals of the project is to facilitate journal searches and interoperatibility between different publishers. The Cornell Library Digital Collections are online collections of historical documents. Featured collections include the Database of African-American Poetry, the Historic Math Book Collection, the Samuel May Anti-Slavery Collection, the Witchcraft Collection, and the Donovan Nuremberg Trials Collection. The library houses several rare manuscripts. It houses one of the five copies of Abraham Lincoln's Gettysburg Address (1863)—the only such to be privately owned and the only one accompanied both by a letter from Lincoln transmitting the manuscript and by the original envelope addressed and franked by Lincoln. The library houses cuneiform tablets; a major collection of medieval books and witchcraft trial records; thousands of pamphlets produced during the French Revolution; and the correspondence between Jefferson and Lafayette. It also holds a copy of The Birds of America, which is considered the most expensive book in the world. The library also has first editions of Darwin's "Origin of Species" (1859), the Book of Mormon (1830), and of Jane Austen's Pride and Prejudice (1813). Rose Goldsen Archive of New Media Art is a research repository for new media art. It was founded in 2002 by Timothy Murray, Professor of Comparative Literature and English and Director of the Society for the Humanities. 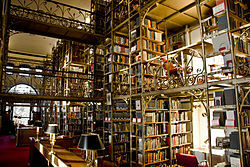 It is located in the Division of Rare and Manuscript Collections at Cornell University Library and it is named in the honor of the late Prof. Rose Goldsen, a Sociology Professor at Cornell University and an avant-garde critic of pop culture, mass media and communication. The Rose Goldsen Archive provides access to detailed archival material that mirrors the historical changes which have happened in new media art in terms of its technological development and experimentation, throughout the years. The archive's collections include multimedia artworks that reflect the transformation of new media art practices from analog to disc-based and from there to networked and web-based application during the past decades. The collections combine artworks produced on CD/ DVD-Rom, VHS/digital video and internet (online and offline holdings) as well as supporting materials, such as unpublished manuscripts and designs, digital and photographic documentation of installations and performances, digital ephemera, interviews, photographs, catalogues, monographs, and resource guides to new media art. The general collection consists of various material about audio/ sound art, eco/ bio art, exhibitions and artist compilations, installations, interactive narrative and poetry, online listserv and internet art journals, performance, theory and critic, video art and cinema. A few artists whose work can be found in the general collection are: Hershman Leeson Lynn, Hill Gary, Iimura Takahiko, Lister Ardele, Snow Michael, Janet Cardiff, Chantal Akerman, Tashiro Charles, Barbier Annette, Jennifer and Kevin McCoy, Shu Lea Cheang, Quintanilla Grace. The collection contains work ranging from the 1960s up to the present day. The Cornell University Library's Division of Rare and Manuscript Collections is located in the Carl A. Kroch Library; access is through Olin Library. The Renew Media Fellowships in New Media, an annual competition for interactive dynamic media, was funded by Rockefeller Foundation in New Media Art from 2002. The Goldsen Archive serves as the repository for the digitized copies of this competition material, such as the proposals, slides, artists’ portfolios, other supportive material, etc. from 2003 to 2008. The Wen Pulin Archive of Chinese Avant-Garde Art, a collaboration among the Goldsen Archive, the Charles W. Wason Collection on East Asia at Cornell University Library and the Dongtai Academy of Art in Beijing, China consists of 360 hours of videotape that documents Chinese contemporary art, installation, performance, video, and rock n' roll from 1985-2002. Some of the artists that are showcased in the collection are: Cui Jian, Du Zhenjun, Feng Mengbo, Li Xianting, Lin Yilin, Lu Shengzhong, Mou Sen, Song Dong, Song Yongping, Xu Bing, Yu Xiaofu, Zhang Dali, Zhou Shaobo, Chen Lingyang. The Yao Jui-Chung Archive of Contemporary Taiwanese Art contains the Taiwanese artist Yao Jui-Chung's portfolio, 8,000 images of Contemporary Art Exhibition Postcards and Taiwan performance art. The "ETC: Experimental Television Center Archives"  is a collection with more than 3,000 artistic video tapes and DVDs. It contains works by artists from both the contemporary and first generation of video art. The Rose Goldsen Archive of New Media Art has served as a repository for the Experimental Television Center's collection (1969-2011), since 2011. Some of the artists that are showcased in the collection are Barbara Hammer, Gary Hill, Jud Yalkut, Aldo Tambellini, Benton C Bainbridge, Irit Batsry, Alan Berliner, Kristin Lucas, Lynne Sachs, Michael Betancourt, Abigail Child, Laurence Gartel and Barbara Lattanzi, Emergency Broadcast Network, Nam June Paik, Kathy High, etc. Net Art: The Goldsen Archive provides access to a number of internet art collections. It is the off-line repository for the Turbulence.org archive, a project of New Radio and Performing Arts, Inc. (NRPA), the Computerfinearts.com and the Infos 2000. In addition, the Archive serves as an on-line repository for the online journal of net.art, CTHEORY Multimedia and the Ecopoetics online exhibition. Because of the fragility and the complexity of the artworks, most of which are born-digital and many of which interactive, the Archive focus on building archival strategies that endure the continuous access to all this fragile material. The Goldsen Archive is one of the six international digital art archives dedicated to Preservation and Documentation Strategies; other similar archives are Ars Electronica, Tate Intermedia, FACT, computerfinearts.com (which has its repository in Goldsen Archive) and Rhizome Artbase. In addition, the Archive has signed the International Declaration "Media Art Needs Global Networked Organization and Support", sponsored by Media Art History. Org. The Goldsen Archive has completed a National Endowment for the Humanities- funded preservation initiative that aims to make the access to complex interactive and digital born media artworks simple and more reliable which will allow these artworks to be used and viewed on modern computers. ^ "Collections - Cornell University Library". www.library.cornell.edu. ^ admin (7 July 2006). "The Nation's Largest Libraries: A Listing By Volumes Held". ^ a b "Southeast Asia Collection (Echols) - Kroch Library, Division of Asia Collections - Cornell University Library". asia.library.cornell.edu. ^ "The library that never sleeps". Ezra magazine, Cornell University. Retrieved 2015-03-04. ^ "The Gettysburg Address". RMC website. 2013. Retrieved 2015-03-04. ^ A., White, Jeanne (10 June 1999). "Ornithology Collections in the Libraries at Cornell University: A Descriptive Guide". rmc.library.cornell.edu. ^ Flood, Alison (6 January 2012). "World's most expensive book, Birds of America, set to fetch $10m". The Guardian. Retrieved 2013-06-09. ^ "Origin of Species". Cornell University Library. Retrieved 2015-03-04. ^ "Book of Mormon". Cornell University Library. Retrieved 2011-10-11. ^ "Pride and Prejudice". Cornell University Library. Retrieved 2015-03-04. ^ Murray, Tim. "Bio of Tim Murray". Society for the Humanities. Cornell University. Retrieved 16 June 2015. ^ a b "Narrative Section of a Successful Application" (PDF). National endowment for the humanities, Division of Reservation and Access. National endowment for the humanities. Retrieved 16 June 2015. ^ Murray, Timothy. "About the project". Rose Goldsen Archive of New Media Art. Cornell University Library. Retrieved 18 June 2015. ^ a b "Renew Media/Rockefeller Foundation Fellowships in New Media Art". Rose Goldsen Archive of New Media Art. Cornell University Library. Retrieved 18 June 2015. ^ "Chinese Avant Garde Art Archive". Chinese Avant Garde Art Archive. Cornell University. Retrieved 18 June 2015. ^ "Biographies". Chinese Avant-garde Art Archive. Cornell University. Retrieved 24 June 2015. ^ "Yao Jui-Chung Archive of Contemporary Taiwanese Art". Rose Goldsen Archive of New Media Art. Cornell University Library. Retrieved 24 June 2015. ^ a b "Video library and archives of the Experimental Television Center (ETC)". ETC, Rose Goldsen Archive of New Media Art. Cornell University Library. Retrieved 18 June 2015. ^ Murray, Timothy. "NEA Collaboration Grant: Turbulence + Rose Goldsen Archive of New Media Art". HASTAC:Humanities, Arts, Science and Technology Alliance and Collaboratory. HASTAC. Archived from the original on 27 February 2015. Retrieved 18 June 2015. ^ Kroker, Arthur; Kroker, Marilouise; Murray, Timothy. "About the journal". CTHEORY MULTIMEDIA. Cornell University Library. Retrieved 24 June 2015. ^ Murray, Timothy; Shevory, Tom; Zimmermann, Patricia. "Ecopoetics Online Exhibition". Rose Goldsen Archive of New Media Art. Cornell University Library. Retrieved 30 June 2015. ^ About the fragility of digital media see: "Preservation 101: Media Preservation". Independent Media Art Preservation (IMAP). IMAP c/o Lehman College. Retrieved 18 June 2015. and "EAI Online Resource Guide for Exhibiting, Collecting & Preserving Media Art:Preservation". Electronic Art Intermix. Electronic Arts Intermix. Retrieved 18 June 2015. ^ "Digital Art History Databases: Preservation and Documentation Strategies- Archives". Ingo Studio: Paul Hertz. Retrieved 18 June 2015. ^ "Media art needs global networked Organisation & support – International Declaration". Media Art History. Media Art History. Retrieved 18 June 2015. ^ Casad, Madeleine Imogene (April 2004). "Preservation and Access Framework for Digital Art Objects". D-Lib Magazine. 20, Number 3/4 (In Brief). doi:10.1045/march2014-contents. ISSN 1082-9873. Retrieved 18 June 2015. ^ Cook, Michael (1 June 2004). "Core Historical Literature of Agriculture (CHLA)". chla.library.cornell.edu. ^ "Asia Collections - Kroch Library, Division of Asia Collections - Cornell University Library". wason.library.cornell.edu. ^ "The Cornell University Hip Hop Collection". rmc.library.cornell.edu. ^ "Home Economics Archive: Research, Tradition and History (HEARTH)". hearth.library.cornell.edu. 31 March 2003. ^ "Human Sexuality Collection - Rare and Manuscript Collections". rmc.library.cornell.edu. ^ "Kinematic Models for Digital Design Library (KMODDL) - Engineering Library". kmoddl.library.cornell.edu. ^ "Cornell University Library Making of America Collection". cdl.library.cornell.edu. ^ "Race, Ethnicity and Religion - Cornell University Library". racereligion.library.cornell.edu. ^ "ETC / Experimental Television Center - Rose Goldsen Archive of New Media Art". hdl.handle.net. ^ "Chinese Avant-garde Art Archive". asia.library.cornell.edu. ^ "Lynn Hershman Leeson Archive - Cornell University Library". hdl.handle.net. ^ "Samuel J. May Anti-Slavery Collection". www.library.cornell.edu. ^ "Cornell University Library Catalog". hdl.handle.net.